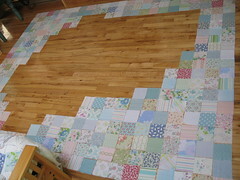 Laying out quilt squares... something I learned at a retreat was to tape up a 'design wall'. You can use a flannel sheet or the fuzzy underside of an old mattress cover. Something with nap to 'grab' the fabric. Then you can layout the pieces on the wall and stand back to look at it. A straight pin pushed down, parallel through the fabric to hold it, works to stabilize squares that want to fall off. It is also better to view the design from looking straight on instead of down. Saves bending and having to pick everything up later!